Data and disaster recovery is a critical component of any business’ contingency plan and something that’s integrated into the planning of their server systems. By being prepared and having the correct data recovery procedures in place, businesses ensure that they can quickly and safely recover data and get servers back to functioning quicker. Particularly at the enterprise level, a disaster recovery plan is critical to the continued operation and success of a business. From natural disasters to malicious activity, there are plenty of reasons servers and mission-critical systems crash. Because of this, businesses look for professionals in the IT world with the skills needed to mitigate disaster, restore servers and applications, and allow their business to continue operating smoothly. Virtualization platforms face unique practices when it comes to disaster recovery. The flexibility of a virtualization platform means that if the correct practices are in place, applications and data can be easily replicated and moved to new servers. Virtual server disaster recovery is simplified by the powerful recovery tools included in most virtualization platforms. VMware offers several software tools such as Site Recovery Manager, which manage and automate many components of site recovery including vSphere Replication and storage replication. Data and site recovery is a critical component of working with a VMware platform. It is something that every professional who administrates a VMware environment should be knowledgeable about. At VMware Certification Marketplace, we offer a range of learning materials encompassing all areas of VMware; including a complete and comprehensive guide to Administrating VMware Site Recovery Manager 5.0. This guide to VMware data recovery and site restoration is written by Mike Laverick, certified vExpert. 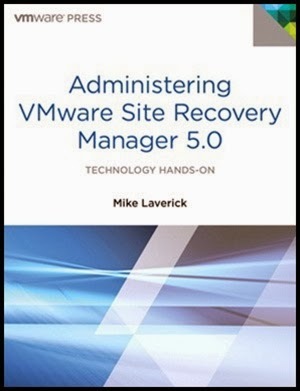 It covers everything virtualization professionals need to know for effective site recovery – from installing Site Recovery Manager 5.0 and understanding the features, to configuring vSphere Replication for fast replication of applications and storage devices. It even defines custom site recovery plans. If you’re an IT professional who’s administrating a virtualization system, don’t wait until your site crashes. Be prepared, mitigate risk, decrease downtime, and protect critical data with this comprehensive guide to VMware Site Recovery Manager.